We were introduced to Daniel Herskedal’s music recently through a Spotify playlist. His tune “The Lighthouse” was featured and it just blew us away. The track was mesmerizing and inspired us to learn more about Daniel and his musical story. As you will read (and hear via our own Spotify sampler playlist), Daniel is an engaging artist charting his own compelling course that is worthy of your ears as well as wider recognition on the greater jazz stage. (Jazz Online) What was your first recollection of jazz growing up? (Daniel Herskedal) I grew up in the small town of Molde in Norway. It is the home of the Molde International Jazz Festival which is now one of the oldest in Europe and has programmed the greatest jazz bands and musicians in the world since 1961. The festival gave me the chance to see world class musicians from early on. One of my first memories was a concert with Danish trumpeter Palle Mikkelborg when I was probably around 10. I also saw artists like Stevie Wonder and Eric Clapton there when I was young. A very important thing Moldejazz is doing is arranging improvisational workshops for school band members, and then they do street parades every morning at the festival and all the young musicians get an artist pass that gives them free entrance to most concerts the entire week of the festival. That has helped raise several professional musicians in the area. It’s done by a New Orleans inspired band, and I started my own band with my friends in the school band at 14. We toured for more than 10 years together. The festival has also given me the chance to play with Jason Moran which was very inspiring and evolving. What was the first jazz recording you ever purchased? A Louis Armstrong cassette (I forgot the title). This changes all the time. 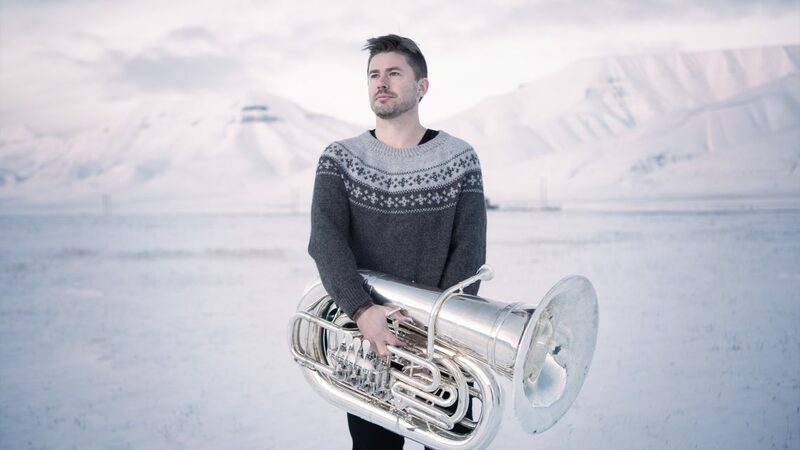 In the first years it was tuba players David Gald and Stein Erik Tafjord, that was during the school band improvisation workshops. Later, I listened and heard a lot from non-tuba players to develop my playing and sound. Trumpet players Palle Mikkelborg and Arve Henriksen have been really important sound wise. They inspired me to go hunting for my own personal tone and sound. In later years, I’ve been digging other traditions for adoptable soundscapes – old traditions that survived time like Arabic music and Sami folk music. What is the best thing about playing jazz? It’s a fantastic thing to be on stage with other creative musicians and create and develop tonal stories that move people, make people shout, cry, laugh, stand up, lie down, meditate, and travel in mind. Also, when you play original music and search for new concepts and soundscapes all the time it’s really important to find the right people to play with and develop the music together. It’s really satisfying when you do that. How did you select the tuba as your main instrument? I’ve always been fascinated by bass sounds. The conductor in the school band asked me to try the tuba when I told I was going to quit playing the french horn and use my time in the boxing club instead. I was immediately inspired from the first note. My older brother also plays tuba and that meant a lot to me. And when the boxing trainer quit and the club closed down, I had all the time in the world to practice tuba. What is the biggest misconceptions and challenges about the tuba and improvisation? The stereotypical sound of the tuba is probably what most people imagine when they see a photo or a line up with my instrument. For me it’s not very important that I play the tuba – that’s just the tool I have to create music and soundscapes. It’s a (jazz) instrument that has few idols and it’s a lot more to discover and develop in the future for me and for other jazz tuba players. I, for sure, see more possibilities than challenges with it. Can you talk about the vast influences that make up your compositions? I have a varied musical background coming from both classical and jazz, and I’ve worked with a lot with folk musicians from different European and Asian traditions. Composition wise, I find more inspiration in the classical music history, but I incorporate that with rhythmical elements of today’s jazz. The spiritual way of performing melodies is something I’ve learned from the older music traditions. How would you describe your new recording Voyage? It has a naval cinematic theme. The music is melodic, melancholic but yet rhythmical and occasionally complex. I think of it as film music. The titles gives a clue to the audience where to start imagining. The titles also have inspiration from modern day observations, but also historical events from times when the world was ruled with sail ships. The track “The Lighthouse” is captivating and beautiful. What was the inspiration behind writing the tune. Thank you! I was asked to make a music demo for the film Last Black Man In San Francisco directed by Joe Talbot (which premiers June 14, 2019). After I read the script, I wrote “The Lighthouse” for one of the scenes. It wasn’t used but I ended up writing and recording something else for the film but I still wanted to use “The Lighthouse” on Voyage. “The Lighthouse” connects Voyage to my recording Slow Eastbound Train – continuing the world of Mistral Noir. Name one recording that cannot live without. Palle Mikkelborg “Prince of Peace” from the album Anything But Grey. Fishing and mountain hiking. I’m from a fjord where you can do both, but haven’t lived there since I was 19. Those possibilities will always be a port of me that I’m dreaming of when things are too busy and tough, it’s the perfect head space activities. I often bring both fishing kit and hiking shoes when touring in Norway.